Wellington’s line of ATMs makes it quick and easy for you to balance and load cash daily…use your ATM like an unmanned cash register. 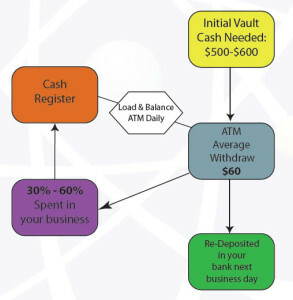 No need to invest thousands of dollars to fill your machine – vault cash is constantly recycled and deposited in your checking account daily. Repairs??? Never pay for a repair again!! All Wellington equipment is 100% owner/operator repaired and comes with an available 5-year warranty. Call us TODAY and start making money with your new Wellington ATM!! 1-800-494-6984.